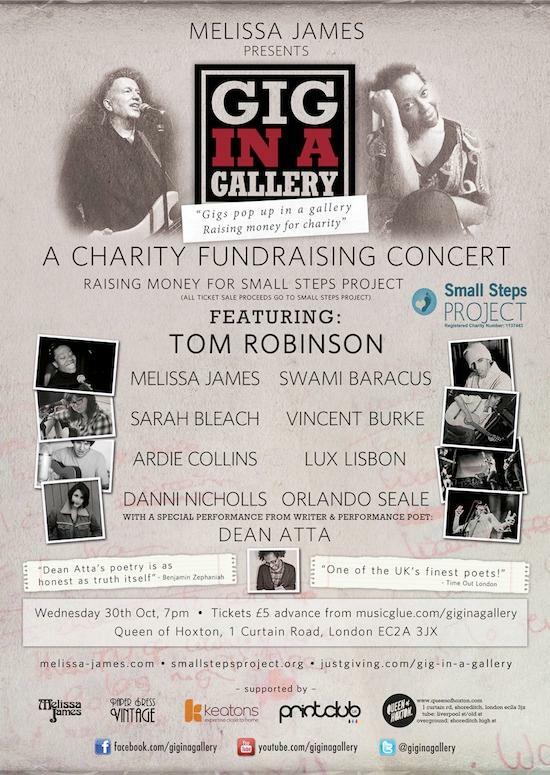 Tom Robinson, musician, 6 Music radio presenter and all-round excellent chap, will be headlining a charity fundraising show, Gig In A Gallery, at the Queen Of Hoxton in London next Wednesday, October 30. The event's being put on by the singer-songwriter Melissa James as part of a number of pop-up gigs in aid of Small Steps Project, a charity working to help Cambodian families living on rubbish tips escape from poverty - you can read more about it at their website and watch a video at the foot of the piece. James herself will be on the bill, performing material from her recently released debut album Day Dawns as well as a one-off collaboration with Robinson, with Swami Baracus, Sarah Bleach, Vincent Burke, Ardie Collins, Danni Nicholls, Lux Lisbon, Orlando Seale and Dean Atta all joining them on the line-up. Tickets are £5 in advance - head to the Gig In A Gallery website to get hold of them - and £6 on the door, with all profits going to the Small Steps Project.